Arrive in San José. You will be met at the international airport and taken by comfortable A/C van to the Xandari resort and spa. 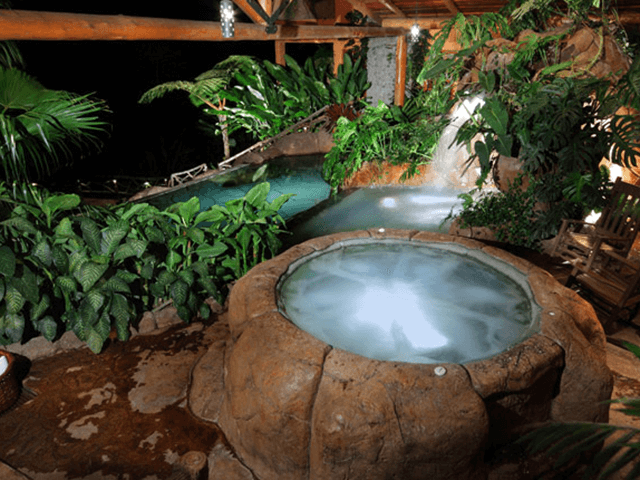 Hotel Xandari: The Xandari Plantation is a tropical paradise of 16 private villas, secluded on a coffee plantation overlooking the Central Valley of Costa Rica, only minutes from the International Airport. Elegant decoration and unique style makes this place stand out from the crowd. There are private and scenic trails you can walk on, a number of waterfalls, and peace and quiet. It’s still close to the airport, but it might as well be a thousand miles away! A simple continental breakfast (plus great coffee) awaits you in the morning. In mid-morning, you will be taken by minivan to the airport for the late morning flight to Quepos/Manuel Antonio. 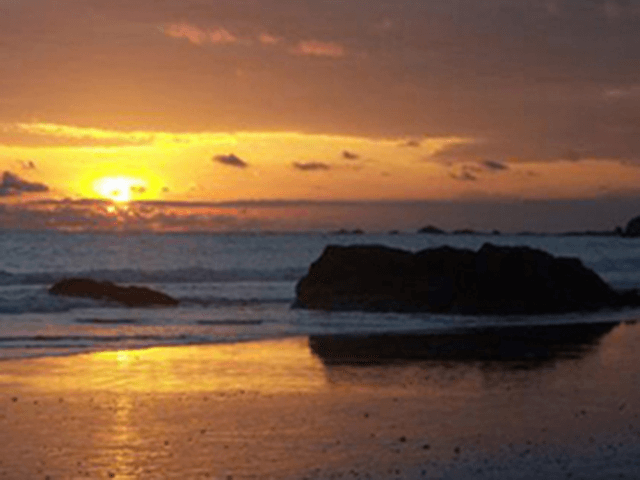 A quick flight takes you to beautiful Manuel Antonio, on the central pacific coast. 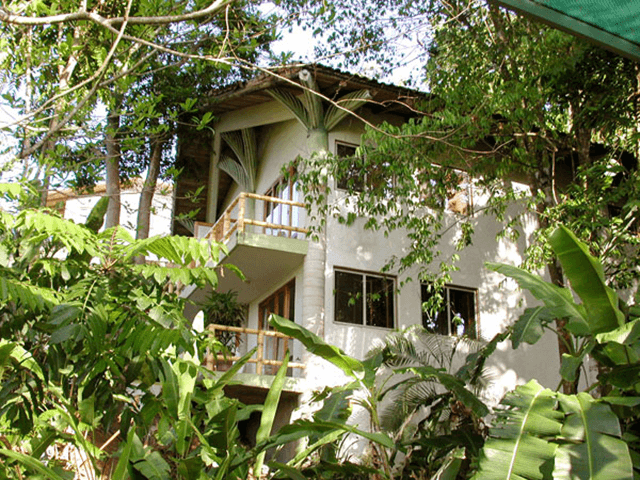 You will stay at Si Como No Hotel, one of the Manuel Antonio’s (and Costa Rica for that matter) exclusive destinations. The guided tour or Manuel Antonio is an informative hike where you will encounter sloths, monkeys and more. Guides also provide a great deal of information on the history, flora and fauna during this easy 2 1/2 hours walk. Manuel Antonio is one of the most beautiful areas of Costa Rica and we encourage you to explore! Of course, we won’t hold it against you if you stay close, watch the monkeys, have a drink in the ‘bat cave’ and just relax! Now journey north, via cab to Quepos, and then a short flight to famous Tamarindo in the north pacific. At the airport, you will be taken to the lovely El Jardin del Eden, staying in a Garden Suite Villa with your very own private pool! Luxuriate at the El Jardin del Eden beside your own pool, on the beach, or anywhere else you might want to. Sunset and snorkeling tour included. 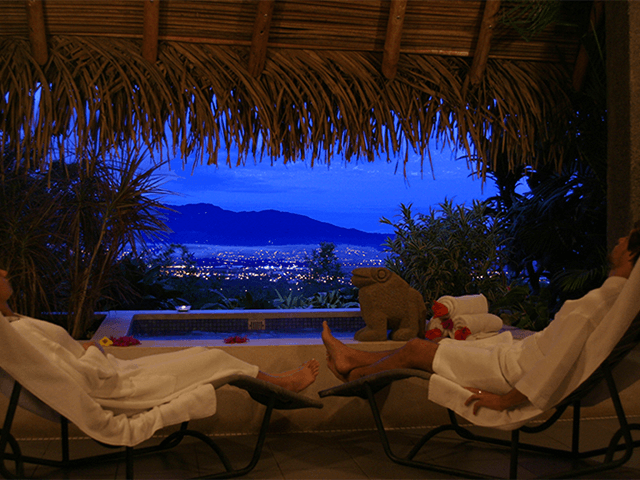 Stay overnight at the El Jardin del Eden in a Garden Suite villa. 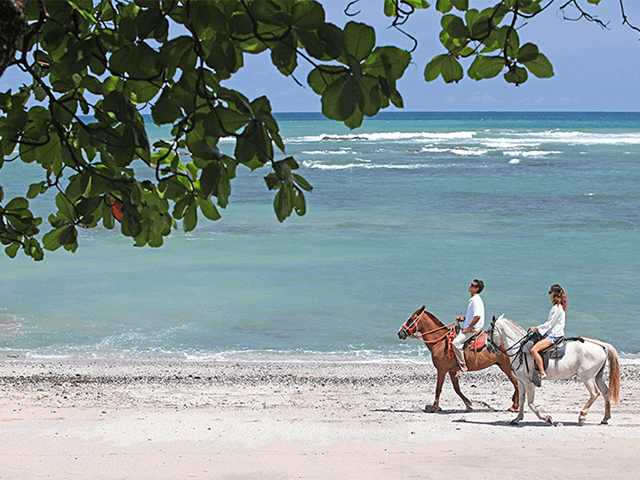 Many tours are in the area, like horseback riding on the beach. Again board a jump plane back to San José for your final night’s stay at the most unique and secluded Peace Lodge in a fantastic suite. What makes it special? For one, there are only three, VERY interesting rooms… you have to see them to believe them! The rooms are designed with unique amenities such as oversized balconies, Jacuzzi tubs (in every room), waterfall showers and grand stone fireplaces. From the handcrafted canopy beds and love seats to the original stained glass and illustrated artwork you will understand the time and care put into the details of each accommodation. We assure you that you will never forget your stay! Alas, all romantic retreats must come to an end. Transport back to San José where you board your plane back to home. We wish you love, peace, and happiness throughout your lives. And we hope we gave you some great memories to share for a lifetime!